Derivatives Trading has been one of the principal occupations of many market aspirants since derivatives were introduced in India in 2001. The derivatives market has seen the evolution from equity to commodities to currency to interest rate futures. However, equity derivatives have remained the largest trading financial asset in India. Derivatives, as the name suggests, derives its value from the underlying. However, there are instances when derivatives position understanding would indicate a possible trend in the underlying. 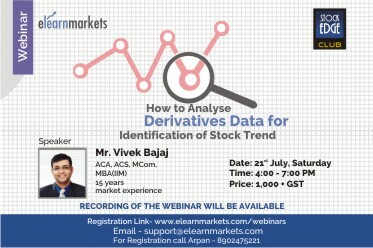 A sound understanding of all relevant derivative analytics tool will help a derivatives trader to excel in the market. To make the participants understand all relevant tool to identify a trend in the underlying. Vivek Bajaj has been trading derivatives since 2002. He is the co-founder of one of the largest proprietary trading desks in India with over 150 traders. He is also co-founder of elearnmarkets.com and StockEdge app. He is part of various committees of exchanges and has been an active contributor in the evolution of Derivative Market in India. He has been a speaker at various colleges and higher institutions including IIT and IIMs. Derivative with open interest and Option trading, needs to be discussed elaborately in the next webiner. It is my first Webinar and learned a lot. Many thanks to Vivek Sir. Excellent. Very satisfied. Study of Intraday change in the OI during market hours so that BTST or STBT trades could be taken. Session was good. Please conduct sessions on elliot wave theory too. Wish to be a part on more webinars for advanced topics . PLEASE INTEGRATE WITH MARKET PROFILE AND ORDER FLOW TECHNIQUES, WHICH ARE MORE RELEVANT AND THE LATEST METHODS FOR BETTER APPRECIATION SINCE THETRADITIONAL INDICATORS SERVE ONLY LIMITED PURPOSE AND LAGGARDS.